Beet Horseradish | What Smells So Good? The holidays have never held huge amounts of wonder, excitement and longing for me. Unlike most kids I knew growing up, we saw my grandparents (our only relatives in the province) quite regularly - and aside from Christmas gifts once a year, our gatherings were more or less the same. Turkey dinner for Thanksgiving was special not for the meal itself, but for the rituals surrounding it - I learned early on in life to "give the turkey a bath" (i.e. thaw it in the laundry tub full of water) and to both pat it dry and "dance with it" (how my mom used to wrestle it out of the packaging and prepare it for trussing). While Mom did the bird, glazed carrots and infamous cheesy broccoli and cauliflower, what I clamoured for the most was my paternal grandma's mashed potatoes - a recipe that I have (at least according to her current recollection) but have never been able to recreate. Christmas dinners, though, were my maternal grandparents' domain. While we occasionally had a turkey on the table, more often it was roast beef - my grandpa's favourite and (for him and I) the best excuse ever to down a jar of pickled onions and heaping scoops of pickled horseradish. I've loved horseradish for as long as I can remember, and over the holidays it migrated from on top of roasted meat to inside mashed potatoes, mixed with boiled Brussels sprouts and asparagus and carefully scooped onto sliced Havarti over Triscuits. Most of the time, our horseradish enjoyment was in the form of the plain, white jarred stuff (but not the creamy kind - blech). However, once every few years, Grandpa would find beet-tinted, freshly made and hotter than heck fresh horseradish at the deli and bring it home. He and I were the only two people at the table that truly loved the stuff, and while I never liked beets on their own growing up, the fresh zip of the radish made the earthy sweetness just work on my tongue. Today would have been my grandpa's birthday (shame on me, I wouldn't know what year), and while he's not with us in person he's definitely partaking in spirit. In his honour, I dug out my jar of fresh, homemade, pink-hued horseradish and scooped out a helping over my roasted sprouts tonight. The garden-harvested produce really brought their A-game to the table, and don't mellow as fast as the storebought stuff, meaning wallops of flavour in every mouthful! 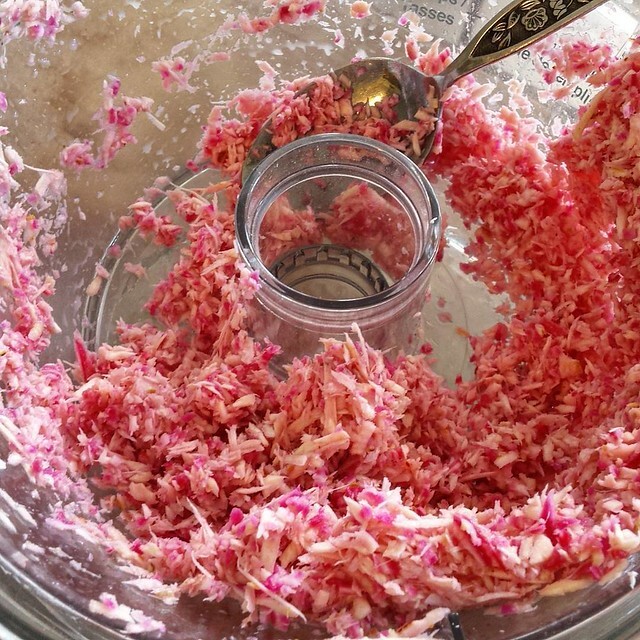 Using a food processor fitted with the coarse shredder attachment, shred horseradish and beet. Change the processor blade to the “chopping” S blade and return the horseradish mixture to work bowl. Add ¼ cup of vinegar and process until mixture is almost smooth, scraping down sides of bowl occasionally, about 5 minutes. In a pot, combine the remaining vinegar, sugar and salt. 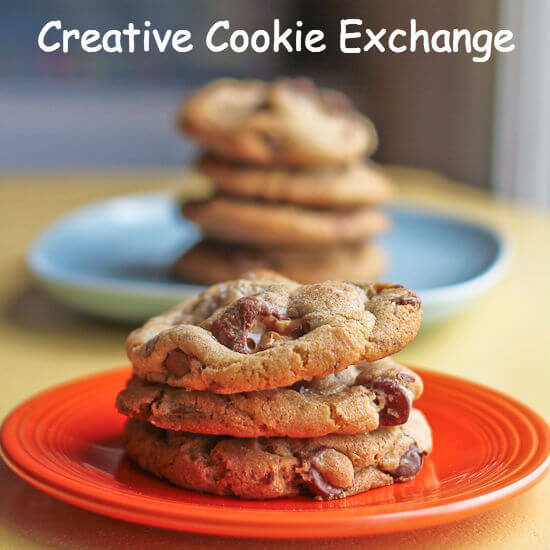 Bring to a boil, then pour over the mixture in the jar and seal.